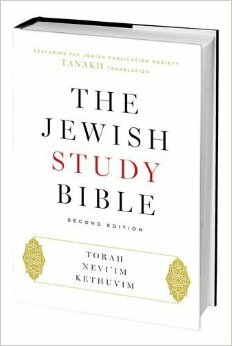 "The book of Genesis is thus, in more senses than one, a primary source for Jewish theology. It presents its ideas on the relationship of God to nature, humanity in general, and to the people of Israel in particular in ways that are, however, foreign to the expectations of most modern readers. It is therefore all too easy to miss the seriousness and profundity of its messages. For the vehicle through which Genesis conveys its worldview is neither the theological tract nor the rigorous philosophical proof nor the confession of faith. That vehicle is, rather, narrative. The theology must be inferred from stories, and the lived relationship with God takes precedence over abstract theology. Those who think of stories (including mythology) as fit for only children not only misunderstand the thought-world and literary conventions of the ancient Near East; they also condemn themselves to miss the complexity and sophistication of the stories of Genesis. For these are narratives that have evoked interpretation upon interpretation from biblical times into our own day and have occupied the attention of some of the keenest thinkers in human history. One aspect of narrative in Genesis that requires special attention is its high tolerance for different versions of the same event, a well-known feature of ancient Near Eastern literature, from earlier times through rabbinic midrash. The book presents, for example, two accounts of Abram/Abraham's attempting to pass his wife off as his sister (12.10-20;20.1-18; cf. 26.1-11, where Isaac does the same), two accounts of God's making a covenant with him (ch 15 and 17), two accounts of how Jacob's name was changed to Israel (32.23-33; 35.9-15). In these instances, most modern biblical scholars see different antecedents documents that editors (known as redactors or compilers) have combined to give us the text that is know in our hands. This could not have happened, however, if the existing variation was seen was seen as a serious defect or if rigid consistency was deemed essential to effective story telling. Rather, the redactors have chosen a different approach, retaining variant versions and treating them as sequential events in the same longer story. The result is a certain measure of repetition, to be sure, but the repetition is in the service of a sophisticated presentation of themes with variations in a book rich in narrative analogy, revealing echoes, and suggestive contrasts. For the Rabbis of Talmudic times and their successors through the centuries, the exploration of this subtle literary features provided an indispensable insight not only into the first book of the Torah (the most sacred part of the Tanakh) but also into the mind of God." The Bible is sacred text. The various writers working down through the centuries in different places & times were all inspired by the spirit of God. The bible is NOT God, though. However, I and many others often treat the bible as if it were God. We treat it the same way we treat God when we try to bend it to our will, to make it do and say what we want it to. We love to try and force both God and the bible to do our bidding. That way, we have the power. We can whip out God or the bible to smack down those we don't like. We luvs us a nice, tame, domesticated God and bible. We often believe that we have succeeded at this. We do so by closing our eyes and plugging our ears as we swing this domesticated mini-god around. What we generally miss in the process is that the real God...and his sacred text, are standing a few feet away muttering, "Well, I don't think I'm gonna do that. I'm gonna eat this sandwich instead." Way back in the day, I was going to school in Jerusalem. It was an evangelical christian school with a handful of christian scholars, and the rest being the best & brightest Israeli archeologists. It was there that I had my first major "A-Ha!" moment. It came in the form of a discussion on ancient Israel's exodus from Egypt. The bible asserts that roughly over half a million men left Egypt with Moses. Assuming that most of these adult males had wives and children, you're taking about least 1.5 million people leaving Egypt and wandering in the Sinai desert for forty years. The problem is that there is no archeological evidence to support that what-so-ever. That many people would have left massive trash piles all over the place, and yet there is none. Today, there are not even 1.5 million people living in modern Jerusalem! Before I go on, let me throw this one in too; Ai, the city that was conquered and destroyed after the battle of Jericho? It doesn't exist. It never has! They've been looking for it for centuries. They know exactly where it's supposed to be...and it's not there. Not gonna lie, this information scared me when I first heard it. Did it shake my faith? A little. The bible got it wrong?!?!?!?! Later, I attended Bethel Seminary. There I had another "A-Ha!" moment. I had to deal with the fact that the Old Testament was NOT one smooth read. The first 5 books of the bible are often referred to as "The Books of Moses." But the fact is that Moses didn't write all of them. Also, the rest of the Old Testament readily appears to have been edited & re-edited before being presented in a form that we now use. Fact: To be fair, anyone should have seen that one coming...myself included. Parts of Exodus, Leviticus and Deuteronomy were written after Moses was DEAD. I highly doubt that the ancient Hebrews had the science of zombie reanimation down back then. Also, if you are paying any sort of attention while reading 1st & 2nd Kings, you will notice that the compilers state for the record that they are using a variety of sources for the important stories of the various kings at the tail end of the life of that given king. The problem is not with the bible. My professors quickly pointed out to us that the bible isn't the one getting it wrong. We're the ones getting the bible wrong! TRUTH: We bring a whole series of expectations to the text that the text has no interest in. We bring our unconscious set of cultural baggage to a text that has no knowledge of it. (And I would argue that even if these ancient writers did have knowledge of 21st century, western thought...they wouldn't have cared a fig!) The writers weren't writing to us! They were addressing & answering the questions and concerns of the ancient Hebrews. Let me use this analogy: If you've ever traveled to a foreign country, where English is not the language, you may notice that they talk differently than you. "It's like those French have a different word for everything!" (Steve Martin) You might also notice that they think differently than you...act differently, and so on. It wouldn't exactly be fair to expect someone in modern Japan to think like a modern American, would it? It wouldn't exactly be fair to expect an Aztec to think like someone living in Sweden in the 1800s, would it? Then why would you do that with the ancient Hebrews and the bible? Ask anyone and they'll tell you that I'm big on "Context." You can't really understand anything if you don't understand the context in which an action, or word, or thought is done. Americans strike me as not being big on context. One of our national pastimes is being offended. Taking things out of context is a really easy way to be offended. Remember the part above where the bible said that roughly half a million men walked out of Egypt? The ancient Hebrew didn't have a numerical system. They didn't! They used words and letters for numbers, but it didn't resemble ours. Before that, you can consider the Roman numeral system that was common in Europe. Heck, the Greeks invented Geometry, and they didn't even have a numerical system that resembles ours. But to the ancient Hebrews, numbers were symbolic. They could resemble a set of locked, static items, but they could also infer numerous other meanings. You probably know this on a gut level to begin with. 7= Completion. 3 = perfection. 40 = a generation. Moses was 40 when he killed an Egyptian and ran into the wilderness. Forty years later, God pops up in a burning bush. Forty more years go by and Moses drops dead on his 120th birthday. (Rough anniversaries, those.) The ancient Hebrews would not have concerned themselves with wether or not those were literal years like we might. They would have understood that those numbers represented a period of growth and change in that mans life. So when we're talking about context, we have to keep in mind "Cultural Context," too. 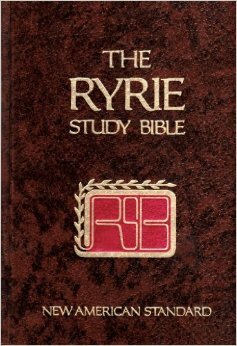 My first study bible was this one, the Ryrie study bible. I still have it. I didn't know it at the time, but this is a study bible for those who embrace Dispensational theology. Most American evangelicals have an unconscious underpinning of Dispensationalism. It has some merits, but it also slices the bible up into distinct districts to be used or discarded like a loaf of Wonder bread. Next thing you know, you get Kirk Cameron movies. Currently, I use an N.I.V. study bible, published by Zondervan. It's good over all, but in the past few years, I have begun to notice what a political document it really is. It clearly has a ton of commentators and contributors, and they don't see eye to eye on all the issues. I'm guessing that some are Calvinists and others are not. Some comments seem to lean towards a Young Earth Creationist view, while others go in a completely different direction. The result is that there are often no comments at all on certain areas where I have questions. In other areas, the comments are so watered down that they are just silly. Example: Gen. 1:7 "So God made the expanse, and separated the water under the expanse from the water above it. And it was so." Commentary = "And it was so." The only possible outcome, wether stated or implied to God's "Let there be." The rather long quote at the very beginning of this post is from the introduction to Genesis. Honestly, when I read it for the first time, it made me cry. (Seriously) It was just so good to read something with honest context. Today's christians...certainly those in America, don't know enough about Judaism. Particularly ancient Judaism. No wonder we get bent out of shape when the bible doesn't conform to our wishes and understanding. We make a huge mistake when we read our modern ideas into this ancient document. 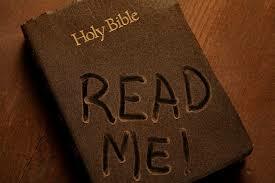 The bible was written FOR us, like it is for everyone, but it wasn't written TO us. If you really want to respect the authors, editors, compilers, AND the Holy Spirit that inspired them, then you need to try and understand the cultural context in which it was written. The sad fact is, many people truly resist that...wilfully! This past autumn, an elder at my church cautioned me on bringing up certain facts about the bible. He said that it would shake people's faith if we challenged certain (Ignorant & uninformed) commonly held beliefs. I agreed with him in a way, but for the opposite reason. So many churches allow their attendees to walk out of a class or a sermon woefully unprepared for the real world and highly intelligent skeptics that are waiting for them. THAT IS A CRIME! Simplistic, simple-minded, pat answers are not going to cut it in the real world. They might suffice inside the evangelical or Fundamentalist bubble, but that's just sad. AND willful, wanton ignorance is nothing to be proud of. Why do you worship such a frightened, little god? BTW: The Profs at Bethel Seminary taught me that no matter how the Old Testament came into it's final form, Jesus used it. He apparently had no problem with it, since it was his spirit that guided it. He certainly used it to full affect on the religious leaders of his day. He adored it! I also doubt that he stayed awake at night worrying that I would "Get" all of it. The older I get, the more I enjoy letting go of the old bible and god that I had constructed. The real ones are much more interesting and compelling. I truly like the fact that the bible confuses me in many areas and leaves me hanging. It forces me to "lean not on my own understanding, but in all my ways acknowledge Him." I like that a lot. At the end of the day, the only threat to my faith is me. There are no others. It's too late for them. Me and my selfish willfulness are the only things that hinder my walk with Jesus. You can throw any and every philosophical, scientific, religious and psychological argument you want at me. It's to late for that. I might not understand every jot & tittle in the bible until I stand before God...and I'll expect him to be grinning at that. I've learned enough to know the following from it; Jesus IS the the Messiah, the resurrected King, the creator God of the universe, and the only, single hope for fallen humanity. Every tribe, every tongue, every tastebud. "When the hour came, Jesus and his apostles reclined at the table. And he said to them, "I have eagerly desired to eat this Passover with you before I suffer. For I tell you the truth, I will not eat it again until it finds fulfillment in the kingdom of God."" "After this I looked around and there before me was a great multitude that no one could count, from every nation, tribe, people and language, standing before the throne and in front of the lamb." Nice picture, eh? That one's actually pretty tame. 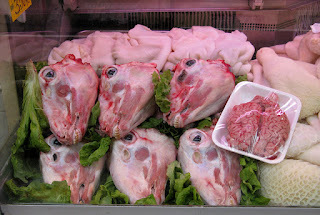 I was looking for one from a meat market in the old city of Jerusalem. Way back when, I went to school there. 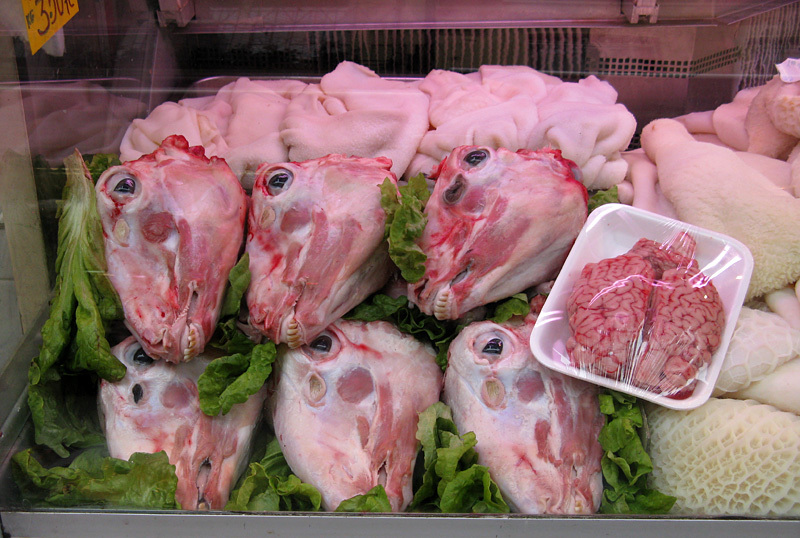 I remember my first day wandering around the old city and seeing skulls of sheep & goats hanging on the wall, all skinned but with the meat & eyes still attached. 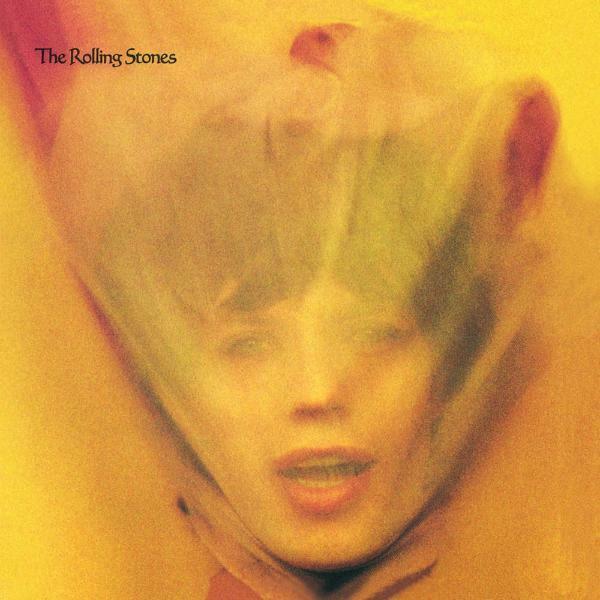 I thought I had wandered onto an album cover for the Rolling Stones or Black Sabbath. We had a pet goat at the school. It had wandered through our rather wide metal gate, but couldn't figure out how to wander back out. A goat makes a very cool pet, actually. We named it "Schwarma," which is Arabic for "Spiced Meat." Take a wild guess what became of it after it had matured? Hey, we donated it all to a local orphanage. I doubt there is a single food out there that I won't try at least once. Just because something is different or unusual, doesn't mean it's bad. I'm a butcher. I work in the meat department of a Co-op in the Twin Cities. I love what I do. I like the people I work with. We're all "Foodies." We talk about meat, produce, fish, and recipes all the time with each other and with customers. In fact, this past week I created a new brat/sausage, in honor of a college kid who works there and gave me the initial inspiration. I call it "Prince of Wales Lamb Sausage." It is ground lamb mixed with leeks, carrots, potatoes and garlic. Like I said, I love what I do. It's fun. Last Friday, the Festival of Nations was in town. So I took my sister over to see it. They pick a theme for the festival and build exhibits around that theme. They also have music, dance and lots of interesting foods. The weirder, the better, as far as I'm concerned. So anyhoo, when I was there it got me thinking. I love other cultures. I wish I could do a lot more traveling than I have. It fascinates me. When I see other cultures, I get a glimpse of what heaven will be like, and what the earth will be like when Jesus' restores everything. The Western mind is soaked in Greco-Roman thoughts and world views, which don't generally line up with the bible very well. This translates into how we view the afterlife. The Greeks thought that the body was a bad thing. A prison of sorts. Go read Plato's thoughts on The Cave analogy. The goal for the Greeks was to escape the body and just be a spirit. That was what was pure & true. This is why you will see images of heaven with angels, harps and clouds. I should state for the record that if that is what heaven is like, I don't want to go. Also, it simply isn't biblical. To the ancient Hebrews, they eagerly awaited a bodily resurrection. Check out Martha's conversation with Jesus before he resurrects her dead brother in John 11. Also, in all three accounts of Jesus' transfiguration, both Moses & Elijah appear in the flesh. Apparently, what ever heaven may be like, you do get to walk around in the flesh. Certainly, in the restored earth you get a physical body. The idea that there wouldn't be some type of physical existence in the next world was completely foreign to the Jews of Jesus day...except for the Sadducees, I suppose. It is also interesting to notice that the bible does hint strongly of joyful feasting in both places, along with numerous other physical activities. My dad tends to fuss a bit over the thought of eating in heaven. "Will we have to poop" he'll ask me? I just retort that we'll have to get the compost from somewhere. I guess my thought is that why would God give us these sensations of pleasure in this life, only to take them away for good in the next one? When I think about the restoration of all things under the new & perfect order that Jesus' reign will bring about, I get excited at all of the new things I'll be able to experience & learn. 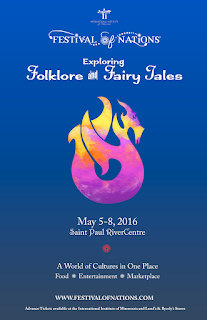 Think of all the cultural flavors, music, art and so on, that will be brought to the table. It's mind blowing! Personally, I'm of the opinion that Jesus will request me as one of his personal salsa makers. I can't prove that biblically, but the Spirit of the Lord has anointed me with much skill with hot peppers and other spices.